Chilli pickers Jarmilla Alders, left, and Linda Sartoris. A FARM in Lake Macquarie is growing what may be the world’s hottest strain of chillies, but preparing them for the public is a task akin to chemical warfare. The variety, bright red and about the size of a dollar coin, is called the Trinidad Scorpion Butch T.
Its grower, Marcel de Wit, of the Chilli Factory in Morisett, sent samples for chemical analysis to ascertain just how it measured up. Fierce … the Trinidad Scorpion Butch T.
The answer was stratospheric, reported EML Chem in Melbourne, where normal duties can include working with explosives. Chilli potency is measured on the Scoville scale. A jalapeno, as used in Tabasco sauce, contains about 5000 Scoville heat units; a bird’s eye chilli packs between 50,000 and 100,000. The Trinidad Scorpion Butch T sample topped 1.46 million. Mr de Wit says this is a world record, but that, like chilli itself, is hotly disputed. Guinness World Records says the present record holder is the Naga Viper chilli, measuring 1.38 million. A sauce containing 58 per cent Trinidad Scorpion Butch T chilli, and called Scorpion Strike, will be launched at the Royal Easter Show. For portions of the manufacturing process, Mr de Wit dressed in protective clothing including an industrial gas mask to fend off the fumes as the chillies boiled. 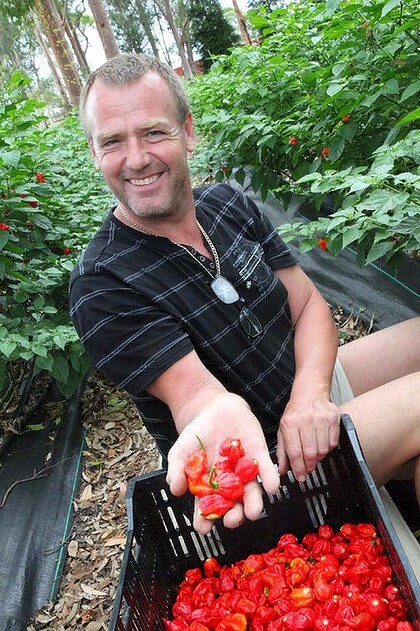 Videos of Mr de Wit and Neil Smith of the Hippy Seed Company, which brought the chillies to Australia, show them struggling to eat the raw chillies. From behind fogged glasses, Mr Smith likens the experience to applying a soldering iron to his tongue and throat. Mr de Wit’s wife, Connie, said she finds the Trinidad Scorpion Butch T too fierce for her palate, although she has watched braver souls try them. ”A lot of people start sticking their tongue out and start flapping their hands around,” she said. Despite an intensity that would overpower most, the chillies are said to have a fruity taste. ”It’s a bit like a banana and an orange together – like a fruit salad,” said Mr de Wit, who answers to the title of the Hot Chilli Chef. I’ve eaten a raw habanero before. It’s pretty damn hot. I’ve had stuff with chili extract in it too. That’s hot too. But my sphincter burns just thinking about putting one of these in my mouth.